Buoyed by an economy re-modelling itself after having adjusted to Western-imposed sanctions, Russia’s exports are expected to grow to US$250 billion by 2024, according to Denis Manturov, the Russian Industry and Trade Minister. Manturov had been attending the Presidium of the Council for Strategic Development and Priority Projects, and stated that export growth is envisaged within the national plan for international cooperation and exports the Council approved on Monday. “In general, the project’s passport has been approved, it provides for export support in order to achieve the goal – the volume of exports of US$250 billion by 2024,” he said. 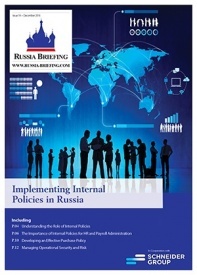 The relevant national project envisages investments of 956 billion rubles (US$14.5 billion). 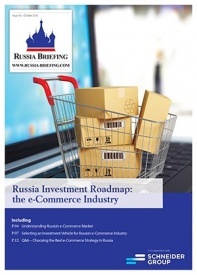 Of this amount 103.8 billion rubles (US$1.6 billion) has already been registered in investment programs. The national project also envisages allocation of 350 billion rubles (US$5.3 billion) from the state budget for the development of industries in six years. A similar amount of funding is envisaged for the development of Russian agriculture. The country’s main export destinations include Netherlands, China, Germany, Italy, Turkey, Belarus, and Japan, among others. While commodities such as oil, gas, and minerals such as gold and aluminium make up a large portion of Russian exports, processed products such as diary, foodstuffs and agricultural machinery are all on the rise, as are the Russian automotive and aviation industries, enhanced by JVs with companies from Japan, China, and India. 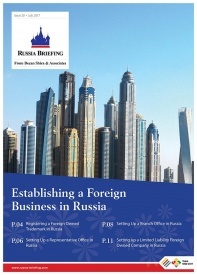 Russia currently ranks 14th in global terms of exports, ahead of countries such as India, Spain, Brazil, and Australia. It is a founding member of the Eurasian Economic Union, a trade bloc that permits duty free trade between Russia, Armenia, Belarus, Kazakhstan, and Kyrgyzstan, a land mass that sits geographically between China and the European Union. Doing Business in China 2017 is designed to introduce the fundamentals of investing in China. 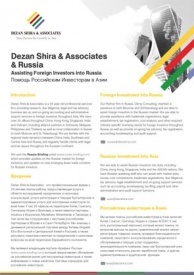 Compiled by the professionals at Dezan Shira & Associates in January 2017, this comprehensive guide is ideal not only for businesses looking to enter the Chinese market, but also for companies who already have a presence here and want to keep up-to-date with the most recent and relevant policy changes. 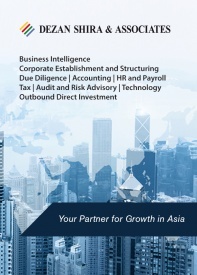 Doing Business in ASEAN introduces the fundamentals of investing in the 10-nation ASEAN bloc, concentrating on economics, trade, corporate establishment and taxation. We also include the latest development news in our “Important Updates” section for each country, with the intent to provide an executive assessment of the varying component parts of ASEAN, assessing each member state and providing the most up-to-date economic and demographic data on each. Additional research and commentary on ASEAN’s relationships with China, India and Australia is also provided.